I worry about theater. Or rather I worry about my changing response to theater. I start losing faith or confidence in its relevance. It has a harder time holding my attention. Then I see a production like the Jungle Theater’s presentation of Sarah Ruhl’s new play The Oldest Boy, and I breathe a little easier. I’m reminded. Oh, this is why we do it. This is how it works. This is theater. Hello again. I missed you. If you love theater, you should see The Oldest Boy. If you like theater but could take it or leave it, you should see The Oldest Boy. If you wonder why the heck anyone still wastes their time creating or watching theater, you should see The Oldest Boy. One of the nicest thing you could do for yourself or anyone else around you right now is to see The Oldest Boy. Why? Because the playwright Sarah Ruhl is brilliant. She understands the human heart and can convey to an audience the messy, wonderful, stupid, terrifying, funny, beautiful things the human heart is capable of. She reminds us why we have a heart, and how to start using it fully again. The last time I saw a Sarah Ruhl play at the Jungle Theater, I was almost mad it had an intermission in the middle of it. No. I want more story right now, please. I don’t need a break. I need more of this. That production was also directed by Sarah Rasmussen. It was one of the many reasons I was so thrilled when it was announced that Rasmussen would be taking the reins at the Jungle Theater full-time as its new Artistic Director, leading it through its next chapter of life. Once again, she’s assembled a fantastic cast for an unusual but powerful story. Like most Sarah Ruhl plays, it’s a story that kind of sneaks up on you. You think it’s just amusing or sweet at first, then by the time you’re about halfway in, you realize how HUGE it is. 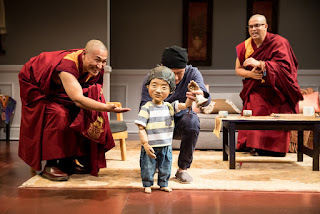 A mother (Christina Baldwin) receives two unexpected guests - a Buddhist monk (Tsering Dorjee Bawa) and a lama (Eric “Pogi” Sumangil) (no, not the animal). She assumes they’re there to meet her husband (Randy Reyes) since he and his family are refugees from Tibet due to the Chinese invasion when he was a child. But the two holy men are actually there to meet her three-year-old son Tenzin, the Oldest Boy of the title (a puppet designed, built, operated and acted by Masanari Kawahara). Tenzin is the latest reincarnation of the lama’s old beloved teacher, who died three years ago, when Tenzin was born. Tenzin recognizes his old friends and his former possessions they bring with them in the way only a child can. 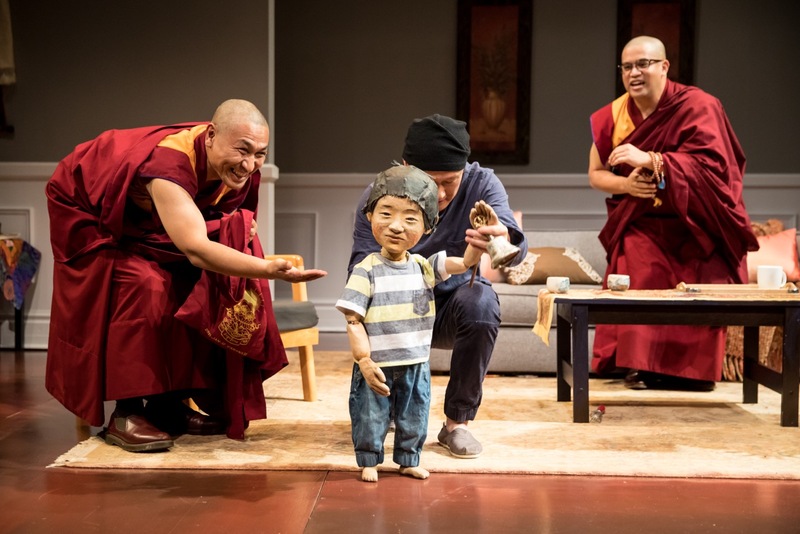 With proof of the connection to ancient Buddhist traditions there now comes a difficult choice - do they allow or support a three-year-old boy’s quest for enlightenment, which would mean leaving his home in America (and perhaps also his parents) for a monastery in India? Mothers always lose their children, eventually. Hopefully, it’s not to death but just to time. Children grow. Children become their own separate people. They don’t need their mother in the same way they did when they were first coming into being, or learning to walk and talk. A mother always thinks she’s going to have more time. However long it takes for the child to leave the home, it always seems like it’s too soon. When you have a child that’s exceptional, that time seems to come all the sooner. But three years old? What do you do when you have a child who’s that exceptional? What do you do when it’s clear what they want, what they probably need, but it’s going to break your heart? And how do you come to grips with the fear that your child isn’t ready for the world, or the world isn’t ready for them? Add to this conundrum the mix of two different cultures and the whole thing becomes more fascinating. The father has been a stranger in his wife’s world for their entire lives together, separated from his spiritual home. This unusual change in his son’s fortunes is now taking the father closer to that home he lost, while leaving his wife feeling like the stranger. The play starts in an environment familiar to most of the audience, and then moves to a very different, but beautiful world which also becomes home to us, and the story. And the child is the bridge, between worlds as well as between lives, past and present. Ruhl is a master at finding the humor in the absurd and the strange, using laughter to help us all relax as we venture into the unknown. The Oldest Boy is just a lovely, lovely play. So human, so touching, so full of feeling. It’s a joy to watch. The production serves the script perfectly. The look and sound of it transport you to worlds both familiar and unfamiliar - Mina Kinukawa’s sets, Sonya Berlovitz’s costumes, Karin Olson’s lights, Sean Healey’s sound, John Novak’s props (and stage management), plus the live music and dance provided by Yeshi Samdup. It’s honestly hard to describe The Oldest Boy because so much of what makes it work is the feeling underneath and between the words, filled in by the great acting ensemble. Consider also that the whole story pivots around how deeply everyone feels about a character who is being played by a puppet - if the puppeteer’s performance didn’t work, or the rest of the cast couldn’t convincingly engage this lively prop, the play would be screwed. As I write this I keep having to remind myself that there was a puppet involved. The little guy was just another member of the cast. And the interaction of human and puppet, particularly the man behind the puppet, made for some truly magical and transformational moments that you have to see for yourself. Thanks for coming to the show and writing all this beautiful articles.